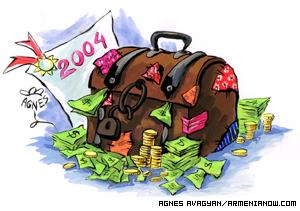 The draft budget for 2004 shows that Armenias government expects to spend 15 per cent more than it earns in tax revenues next year. The National Assembly began consideration of the budget proposals this week, which Vardan Khachatryan, Minister of Finances and Economy, said would place less reliance on external financing than in previous years as a result of domestic economic growth. Khachatryan said the draft budget would not include grants provided by the World Bank for structural improvements, nor funding provided by American-Armenian philanthrophist Kirk Kerkorians Lincy Foundation as well as donations from the Dutch government. Compared to 2003, external transfers will reduce by 53 billion drams (about $94 million). But economic growth compared with last year is bigger by 13 per cent, the minister said. He added that tax collection had improved greatly. State income next year is forecast to be 269.1 billion drams (about $476 million) with expenditure estimated at 311.5 billion drams (about $551 million). The deficit of 42 billion drams is expected to be covered by special purpose external grants. In particular a $14 million loan will be given to Armenia by International Monetary Fund. It has been confirmed this week by the executive council of the fund. This is the fifth allotment of the $100 million loan for Poverty Reduction and Economic Growth Assistance (loans of the Fund are given for 10 years and five years after receiving it the loan has to be paid off at 0.5 percent rate). Armenia has already been given a credit of $58 million through this project during the past three years. With its help currency reserves of the country have been completed and the stability of Armenian dram has been provided. More than 95 per cent of income is achieved through taxes and the budget plans include an expectation that an extra 8 billion drams (about $14 million) will be collected from the shadow economy next year. Failure to achieve this target will add to the deficit. Khachatryan outlined wide-ranging plans to increase spending on public services, saying there would be progress in all fields. Salaries for teachers will double from 15,000 drams (about $26) to 30,500 drams (about $53). The education sphere is expected to be allotted 39,282,000 drams (about $69,525,000), which is 23 percent more than in 2003. Medical workers will get a pay raise of 3,500 drams (about $6) making the average about 33,000 drams. The legal minimum wage will increase by 160 per cent from 5,000 to 13,000 drams (about $23). Family allowances for socially vulnerable will rise by 2,000 drams, while pensioners can expect another 700 drams (about $1.20) on the average payment of 7,800 drams (about $13.80). Quizzed by deputies whether the extra payments would be sufficient to compensate for rises in the price of bread, heating and transport as well as likely increases next year in bills for water, gas and other goods and services, Khachatryan assured that the Government would act to protect the poorest. Standing commissions examined the budget provisions for the Ministry of Defense, Police, National Security Service, prisons, and the Department for Emergency Situations during a closed session of the Assembly on November 22. Spending on defense is set to increase by 12 per cent to 49.5 billion drams ($84 million), with 6 billion drams ($10 million) for the National Security Service, up 9 per cent. Allocations for the police will increase by about 600 million drams. He claimed that the draft budgets allocation to the army was only half that provided for the military in Azerbaijan. At the same time, however, he insisted that the President and Prime Minister will find means for the year 2004 to increase our armament and military equipment. Spending on areas of culture, information and sport is planned to rise by about 9 per cent to 7.479 billion drams (about $13.2 million). There will be 1.186 billion drams (about $2 million) to support cultural activities including theater and concert performances. Some 3 billion drams (about $5.4 million) will be allocated for production of programs through Public TV and Radio and Shirak TV and Radio, as well as for financing the Center of Public Opinion polling organization. This is a 5 per cent rise on 2003, partly to fund the broadcast of national programs abroad. A programme of improvement for Armenias libraries will see 440.9 million drams (about $780,000) provided for reconstruction work at 16 buildings as well as funding the National Library. Salaries for librarians and museum staff will also increase from some 14,000 drams (about $25) to around 16,500 (about $29).